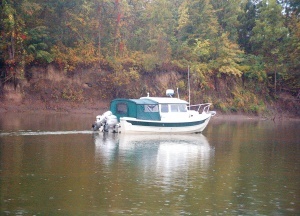 ------A cruise down the Arkansas River is a cruise through time, and a perfect introduction to the geology of mid-continent America. Join us on our geologic excursion from eastern Oklahoma to the Mississippi River. ------There are two fundamental concepts necessary to understand the landscape, and its rock foundation. The first is how the Earth works and the second is the enormity of the time involved. ------Earth began molten, probably more than five billion years ago. In its first billion years, as it cooled, the liquid magmas began to separate. The light-weight components floated to the surface as a silica scum and heavy iron-rich magmas sunk to the interior. The surface silica scum slowly hardened into granitic rock, the continents. The oldest dated rock is 4.4 billion years old. The hot interior churned with motion, like the currents in a simmering pot of oatmeal. It still churns down there. Huge convecting currents slowly move black, iron-rich magma only 50 miles beneath our feet. ------The rotating earth gives order to the currents, creating huge convection cells. Where the cells are directed upwards, the surface crust is mounded by the subterranean heat and pressure and ruptures apart into large solid plates. The open space, where the ridges have been shoved aside, is studded with volcanoes, pouring black basaltic lava from the iron-rich magma below. The lavas cool, forming new crust, which is itself shoved apart by the convecting currents. ------Plates made of this 'new' heavy, iron-rich basalt ride low atop the underlying molten material. The continental plates are granitic, full of light-weight silica-rich rocks, and ride high above the basaltic plates.. As the atmosphere cooled, water condensed and it rained for millenia. Rivers flooded off the continents and flowed to the low areas - those low-lying basaltic plates of 'new' rock - and oceans formed. ------This is the theory called Plate Tectonics (tectos - 'to build'), and geologists believe it is the story of how Earth works. Plates still move, either colliding or sliding under each other. Volcanos erupt creating new crust. ------(Remember, to a scientist a Theory is not an iffy thing -- there are huge mounds of evidence to support a theory, and virtually no factual information in opposition. An Hypothesis is the iffy thing to us. It is our best guess to explain an observed phenomena -- but the facts to support the hypothesis are either lacking, can't be replicated, or have counter-facts in opposition. Plate Tectonics is a theory -- with ample evidence to support the idea). ------Our Moon, also once molten, behaved in the same fashion as the early Earth -- it differentiated into high silica 'continents' and black 'seas.' If the Moon had water, the dark low areas would be the ocean basins and the light-colored highlands would be continents. Next time you look at a full Moon, think of looking at a pint-sized Earth, without water and greenery to block your view of the beauty of pure rock. ------Take a quick look at the map below, the physiography of the continental US. It is quickly evident that our mountains are near the margins of our continental plate. The western Cordillera lie along our plate boundary where collisions have and are taking place (See Cordillera for more detail of this region). The older Appalachians of the east are more subdued, but also result from past plate collision (See Appalachians). Now look more closely at the map. Notice that just below dead center there is an indistinct, almost circular bulge. These are the Ozark Mountains. Now, look more closely. See the east-west dark line (a valley) slicing across the southern third of the bulge? That's the Arkansas River Valley - the terrain for our cruise. ------The more detailed map below shows the physiography of Arkansas. The black area at the top is the Ozark Plateau (the upper part of the bulge above), the east-west Arkansas River Valley (the dark line on the upper map) is our cruising ground, and the dark green below the River Valley is the Ouachita ('Wash It Ta') Mountain region. The bulge seen on the upper map is not quite circular. The eastern side appears to be beveled off, along a northeast-southwest trend. Well, it isn't beveled - that eastern side is actually buried by later sediments, the Mississippi Embayment and West Gulf Coastal Plain. ------The second concept is the enormity of geologic time. We banter around billions of years like our government does dollars. It takes a lot of time to build mountains, and even more to build a continent. So let's take a little time and chat about time and rocks. ------The pile of letters on your desk? Unless you've scrambled them around, the oldest are on the bottom, right? The same with rocks. You've seen layered rocks in roadcuts or river embankments? Unless they've been scrambled, the oldest layer is on the bottom. ------Geologists have patiently sorted out the timing of all those layers. Like detectives, they found clues - fossils - in those rocks. Some of the fossils are from species that lived for only a short time - these are index fossils. By looking at their locations in stacks of rocks, geologists could figure out which fossils predated others and finally figured out the whole stack! Of course, they had to travel all over the globe to get the whole picture through time. So geologists are folks who love to travel, are always rubber-necking at rocks, and who are obsessed with a warped sense of time. ------Oh, and like most folks, geologists love to name things. So, they named the geologic times - first into big units, the Eras. Paleozoic (old life), Mesozoic (middle life), and Cenozoic (recent life). The vast stretch of time before there were critters who left fossils, the Precambrian, is not found on the surface in Arkansas, so we won't talk about it here. Geologists divided Eras into Periods - Cambrian, Ordovician, Silurian, Devonian ... whoa! You may not be interested in learning those names, but listen to the beauty of the words. Say them out loud - Cambrian, Ordovician, Silurian, Devonian ... Wow! Music! ------ The time scale is almost as pleasing to the ear as a musical scale, but it's time to get back to rocks. That fossil-created time scale that geologists created was a relative time scale - even in scrambled up rocks, we could figure which layer is older than another by looking at the fossils. But exactly how old? More recently, a new detective method evolved. It was discovered that some minerals in rocks contain slight amounts of radioactivity that functions like a clock. The clock is 'set' when rock first hardens and slowly, but quite uniformly, ticks along changing into a slightly different isotope. Analyzing a rock in a lab, one can determine the ratio of various radioactive isotopes, and get an age in years! Of course, one of the first tasks for geologists armed with radioactive 'counters' was to date those fossils in the relative time scale, and sure enough, earlier geologists had done it right - the scale was relatively correct, and now we could add absolute dates. ------We've had a musical feast for our ears with geologic time - now let's have a visual buffet. Geologists love to make maps. The maps often just depict the ages of the rocks (under the forest, the soil, the city). Colors are used for each geologic time unit - with a beautiful result. Look at that (larger) map below ... isn't that a piece of artwork? Frame that, and put it on a wall and you have a piece of modern art. ------The map below shows state boundaries so we can locate Arkansas. ------Notice that the top center of the state is pink, the lower portion of a large pink circular area - the Ozark Dome. 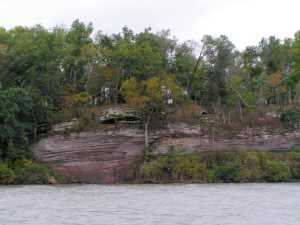 Ozark Pink is the oldest Paleozoic rock, uplifted in the Dome. ------To the southwest of the Dome, there's a brown and dark gray east-west area, under the letters, AR. That brown area is the Arkansas River area. River Brown is younger Paleozoic rock, unaffected by doming. ------Below the brown streak is an east-west patch of dark blue, black, and pink. 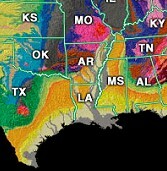 Those colors represent the east- west crumpled Ouachita Mountains. 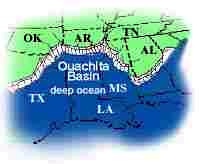 Ouachita Amalgam is a mixture of young and old Paleozoic, folded into an east-west mess. ------The whole southern and eastern part of the state is yellowish. This is the overlapping Mississippi Embayment, a more recent sea invasion over the old Paleozoic rocks. The colors show the ages of the rock - The youngest is Embayment Yellow, latest Mesozoic and Cenozoic rocks lapping over the older rocks. ------ Throughout most of Paleozoic time, the southern margin of our continent lay on a rough east-west line across Arkansas. To the north, a broad expanse of shimmering shallow sea, rich with life, covered most of the continent. To the south was deep ocean.The Arkansas River today flows easterly right along that border. The orientation of the river is not a happy accident, but is the result of different rocks north and south controlling the river's course. ------As you can see from the map above, a cruiser beginning the journey from the head of navigation (the thin blue line in northeastern Oklahoma in the map above) is on the Paleozoic continent. 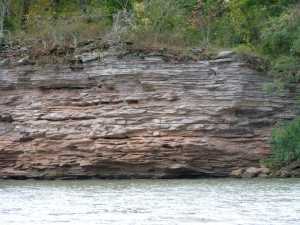 The rocks in that part of Oklahoma are horizontal, bedded limestones deposited in a shallow sea covering the continent (the River Brown area below). In the early Paleozoic, North America lay astride the Equator and the sea was warm and teeming with life. ------If you take the time to poke around these rocks, you can find sea shells and, in some beds, crinoid fragments. 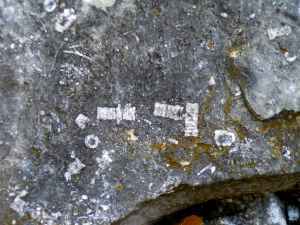 Crinoids were animals that looked like small palm trees. They 'rooted' to the sea floor, rose on a segmented column, and were crowned with flailing 'arms' that captured small bits of food in the warm, shallow seawater. ------These Paleozoic rocks were deposited between 600 and 280 million years ago in that sea that covered much of our continent. During that long time interval, sea level periodically rose and fell, probably in response to the movement of tectonic plates, creating slight changes in sea floor conditions. The thin limestone beds reflect those changes. Traveling in the mid-continent, you will usually be in this terrain of horizontal, gray to tan limestone, that sometimes weathers into a dark gray, brown, reddish, or even black outcrop. 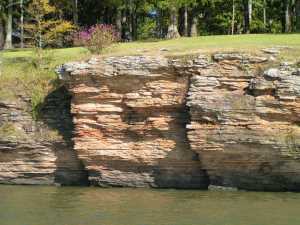 ------As you continue down river into Arkansas, you remain in Paleozoic limestone beds throughout most of western and central Arkansas, the brown streak on the map. The river meanders along its easterly course, and in northern meanders, the usual limestone beds often show a distinct southerly tilt. The river has taken you to the edge of the Ozark Dome, a large semi-circular uplift (Ozark Pink on the map). These rocks are slightly older Paleozoic rocks than those at the beginning of the Waterway. They have been uplifted into a broad dome, and the younger rocks on top have been eroded off, exposing the older layers below. 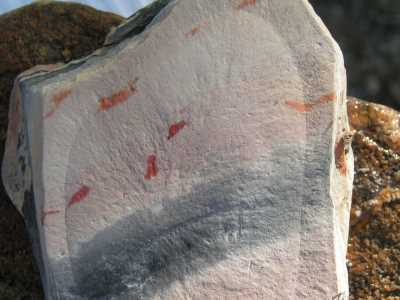 - -----Geologists reconstruct past events by comparing with other areas, with better exposures or more studied rocks. A clue to the origin of the Ozark Dome is the observation of volcanic rocks in the Dome's core, in the St. Francois Mountains of Missouri. This forms the basis of one generally-accepted hypothesis for its origin - it was domed upward by a 'hot spot' (a plume of hot mantle material that rises like a giant upside-down raindrop upbowing the overlying crust). Yellowstone Park lies over a hot spot with volcanic rocks and calderas (circular volcanic basins) similar to those exposed in the much older and more eroded Ozarks. 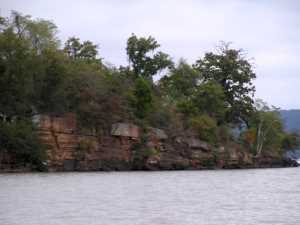 ------When the river meanders southerly, especially east of Ft. Smith, it exposes rocks that were deposited off the continent, in the deep ocean. 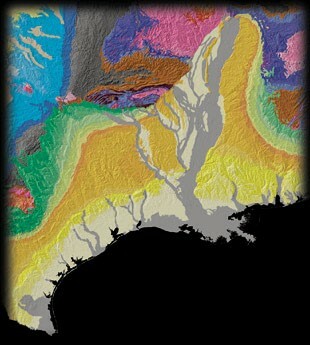 This region, south of the river, was the Paleozoic abyssal plain, under thousands of feet of ocean for hundreds of millions of years (below the River Brown, the Ouachitas are the dark blue, black, and pink east- west amalgam of colors). ------The detritus washed off the eroding continent accumulated into a great pile of fine sands and silts.The weight of these deep-water deposits forced the crust downward into a great trough, containing over thirty thousand feet of sediment. Many of the silts and sands lay on the continental slope until earthquakes triggered their motion down the slope in a great turbid cloud. Settling on the plain, the sediments stratified into fine layers called turbidites. -----Then, everything changed. After more than 300 million years of relative stability, the South American Plate shifted northerly toward North America near the end of the Paleozoic. -----The heavy oceanic plate that separated the continents slid under North America, scraping off the thick mass of turbidites. 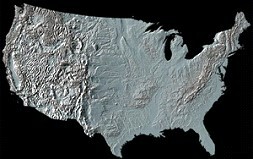 Like a huge rug being shoved against a door jam, the mass folded, faulted and piled up onto the margin of the continent. 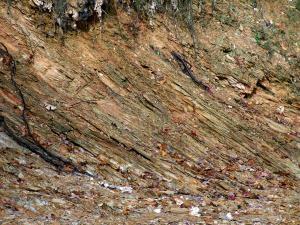 Huge low-angle thrust faults separate great wedges of tilted, folded and greatly deformed deep-water sediment. This uplifted mass accreted to the continent, building it southerly and formed today's Ouachita Mountains. These mountains were once perhaps as high as the Rockies, but 250 million years of erosion have planed them down exposing their interiors. This range is one of the few major east-west trending mountain ranges in North America. ----- After the South America plate accreted the deep water sediments onto North America, it reversed motion and pulled away to the south. This motion opened the Caribbean Sea. ------During the early and middle Mesozoic ('middle life'), the uplifts in Arkansas, the Ozarks and Ouachitas, were above sea level. Dinosaurs strolled over the land. The eroding highlands shed sediments into the opening Caribbean. -----In latest Mesozoic, the North American continent bent downward along the present course of the Mississippi River. The sea invaded up the lowland, several times, as far north as southern Illinois.This trough, the Mississippi Embayment, slowly filled with mud, silt, and sand washed off the continent (the yellowish color on the geologic map). The shallow water embayment continued throughout the Cenozoic until a few tens of millions of years ago. 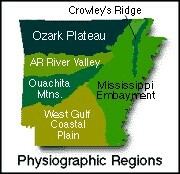 The downwarping tilted eastern Arkansas below sea level and fine sediments covered parts of the older Ozark and Ouachita uplifts. 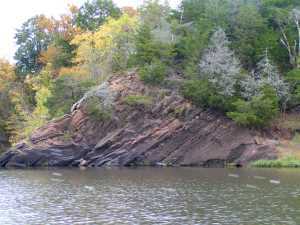 -----During the last part of the cruise down the Arkansas River, from about Pine Bluff to the Mississippi River, you travel through the loosely consolidated recent sediments deposited in this trough. -----The Ice Age, over the past 3 million years, had at least 30 major stages of glaciation. During the most severe, local alpine snow packs, but probably no glaciers, formed in the highest parts of the Ozark and Ouachita Mountains. To the north, the great continental ice sheet crunched southerly as far south as the Missouri River. Huge volumes of water poured southerly from the melting ice sheet to the north. Sediments, ground up by the ice, poured down the Ohio, Missouri, and Mississippi Rivers blanketing eastern Arkansas with sand and silt (Mississippi River Geology). 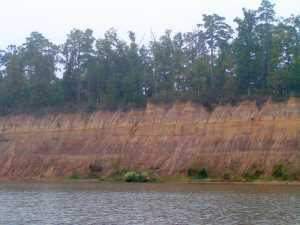 Wind blew the outwash into dunes and sheet-like deposits of loess (wind-blown rock flour, ground fine by glacial ice) that covers all of Arkansas except for the highest parts of the Ozarks. -----A little tangent off the Arkansas River - see the dark green north-south stripe labelled Crowley's Ridge on the map below? In recent times, the Mississippi River trended southerly on the west side of the Ridge and the Ohio flowed parallel on the east side. -----Geology is a study of the past and the present. It is a dynamic science - and things are happening all around you right now. Rocks are 'rotting' into fragments of silt, sand and clay as you read this. Gravity and streams are moving this residuum, depositing it along the banks of creeks, streams and rivers - and ultimately carrying it to the ocean. Somewhere, earthquakes shiver the land and volcanos erupt. Our continent is on the move, westerly, about as fast as your fingernails are growing. -----As long as the wind blows and water flows, the dyamic Earth will be moving under and around us.